Richard Nahem, the fellow who put together the cooking class that I took in Paris in January, has a blog called Eye Prefer Paris. 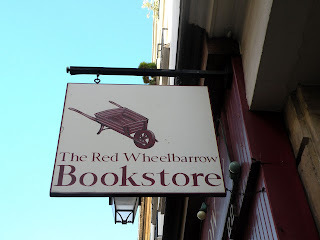 He is posting some old interviews this week and one is with the owner of a small English language bookstore in Paris - The Red Wheelbarrow. Penelope Fletcher is her name and I found her comments on the future of bookstores given the growth of ebooks to be quite interesting. With the recent announcement by Borders that they are going into bankruptcy and closing many stores, it seems a bit prophetic. How are you coping with e-books and electronic reading devices such as the Kindle and how do you see the future of small bookstores like yours? Kindle makes bookselling boring. I think we are going to see all the big publishers go out of business when books become digitally copied for free, which will be in the next six months to two years. In five years from now, the small publishers will become the big publishers and we will start all over again. People love books, people like reminders that they exist as individuals and thinking ones at that. Small bookshops like mine, have to ride the wave, but we need to be supported by the population at the same time. We are the same as the wine sellers, the cheese sellers and the universities -we represent the real. Internet, is ephemeral, not real. It doesn't satisfy the self. A digital book does not exist for ever.You can read it on line and then it is gone, or stored away somewhere that requires electricity - you cant pick it up late at night and read your favorite part to a friend or to yourself. My big worry with kindle and e-readers are that books are going to disappear at a faster rate- print runs of paper books are already smaller and short lived, and the out of print date used to be at two years is now shorter. If you are interested in reading Richard entire interview of Penelope and following his blog, you can it at this link. I am a hard copy book reader. My library card is a lifeline! Yes, I buy books -- but on a fixed income, now I mostly wait for Chriatmas or birthday gift cards. Even my almost 26-year-old son, who was given an iPad by his boss this Christmas, says he'd rather read a paper book. For one thing, always reading on a screen is hard on the eyes. We may be spawning an entire generation who will not only be deaf from the loud music in their ear-buds, but also blind from e-readers and computer screens! I find I prefer the hard copy too, Margaret. I have an ipad and it is useful for traveling - used it for a guide book on my trip to Paris and for some extra reading material. But, I do love holding a book and getting away from computer screens at the end of my day. I liked Richard's comment that small publishers will become will become big and eventually the cycle will begin again....hard to know what will happen. There are ups and downs to the ebook question. I can see the benefit, however I also prefer the "real" book in hand...but will the younger generation who have grown up on electronics? ?